Green Party presidential candidate Dr. Jill Stein calls to end military and economic support for Israel "while it is committing war crimes". 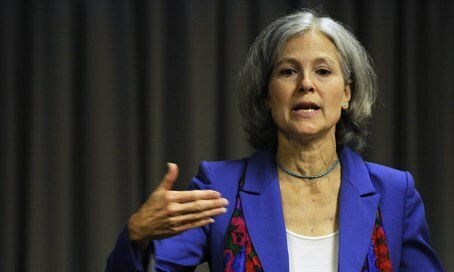 Stein, 64, a physician and a Jewish Chicago native, announced her candidacy for president last February. In 2012, Stein was endorsed by Israel critic linguist Noam Chomsky. She received 456,169 votes (0.36%), mostly in Alaska, Oregon and Maine, noted the Jewish Insider. Democratic presidential candidate Bernie Sanders, while criticizing Israel’s conduct during the 2014 war in Gaza and touting his empathy for the Palestinian cause, acknowledged “there is some level of anti-Semitism” in the BDS movement. Nevertheless, Sanders is associated with some pro-BDS supporters, noted the Jewish Insider. Just recently, Sanders appointed Dr. Cornel West, a prominent supporter of the BDS movement, to the Democratic Party drafting platform committee in order to push for changes in the party’s policy on Israel. Reports indicate that Sanders wants to make "Palestinian rights" more of a priority in the Democratic Party platform. Democratic presidential front-runner Hillary Clinton has addressed the BDS issue numerous times on the campaign trail, notes the Jewish Insider. In a letter sent to Hollywood mogul and major Democratic donor Haim Saban last year, Clinton expressed her “alarm” over the movement’s efforts attempting to “punish Israel and dictate how the Israelis and Palestinians should resolve the core issues of their conflict. Stein’s announcement in support of BDS comes a day after New York Governor Andrew Cuomo issued an executive order directing state entities to divest all public funds supporting the anti-Israel movement. Israeli Ambassador to the UN Danny Danon, who just last week held the largest anti-BDS event yet at the UN General Assembly in New York, welcomed Cuomo's announcement. "Following last week’s ‘Ambassadors Against BDS’ conference and the unprecedented show of force against BDS, Governor Cuomo’s announcement is another effective strike against those seeking to harm Israel," said Danon. "America is Israel’s largest and most important ally, and the Governor’s initiative emphasizes this special bond. This is another victory in the battle against BDS and I am sure that more states will continue to join this fight in stopping BDS across the U.S."